Not sure what the weather is like where you are, but we’ve got snow-a-fallin here outside of Retro Roadmap HQ, so instead of going out on the roads, I’m looking backward down memory lane via my own photo collection.I figured I’d go back as far as I could in my own collection and start with Paragon Park, circa 1984. 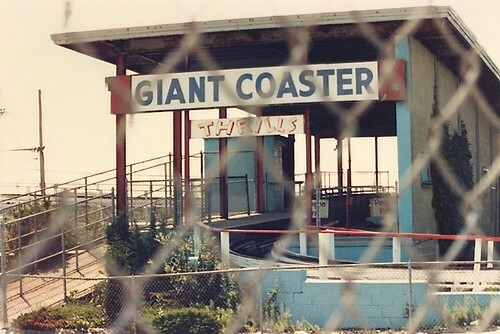 Growing up, Paragon Park, a small amusement park in Hull MA just across from Nantasket Beach was my idea of the ultimate place to go, and we’d hopefully go there once a summer if we were lucky. While my mother caught up with her pal Betty, whom she hadn’t seen in years, and my sisters made new friends with Betty’s daughters I roamed around and snapped random photos with my new 35mm camera. Still learning how to compose a photograph, I think back and realize that my penchant for photos without people in them was in force then, and I went as far as to scribble out the lady who was in the foreground of this photo of the Snack-a-rama. I’m so glad I caught the Art Deco lines and colors, as well as a bit of the ski lift ride as well! I have always been a fraidy cat about going on roller coasters, and I remember my mother telling me that when she was a kid she made my grandfather take her on the giant coaster, and it was the first and last coaster ride she’s been on! I thought it was pretty cool that the Paragon Giant Coaster was on the list of the Smithsonian’s Top Ten Coasters list. I remember thinking that day that I would come back and photograph the place right, and get some good shots as there were rumors that the park would close after the next season. Not only had Paragon Park been permanently shuttered, but I had even missed the public auction of all of the goods from the place. 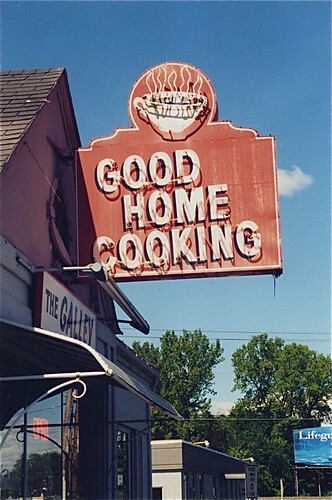 I do recall later that year being able to pick up a trinket or two at Building #19, a local salvage and odd lot shop, but even now the sight of this sign makes me kick myself. I circled the site, which seemed so big when I was a kid, and realized how small it was, surrounded by chain link fencing now. 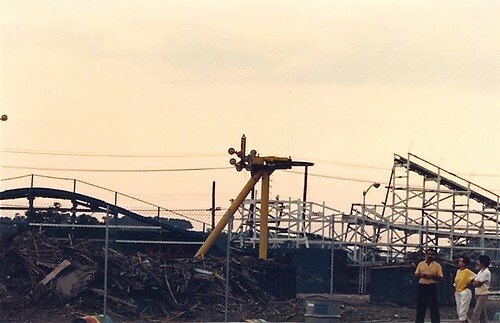 The Giant Coaster sat silent, and the undulating tracks looked like the skeleton of a dinosaur carcass, being slowly dismantled and eaten away at by the vultures that couldn’t wait to turn the site into a condominium complex. All I was left with – besides a footprint on my backside for not taking more, better photos, when I did have the time, were my memories of having an all day pass – discounted by collecting match book covers – stapled to my shirt hem and spending the day riding the kiddie cars, the Congo Cruise, the merry go round and more, playing skee ball in the arcade and eating ice cream on a hot summer day. 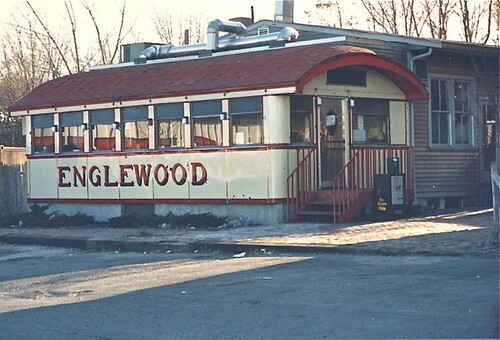 I still visit Nantasket when I can, thumbing my nose at the condos and visiting the carousel (PTC #85) that they saved and moved down the street. But it’s not the same. So folks, remember – tomorrow never knows – if there’s someplace or something you like – go there now, enjoy it, take photos, and do what you can to make sure it sticks around, because some day it might not be there anymore! 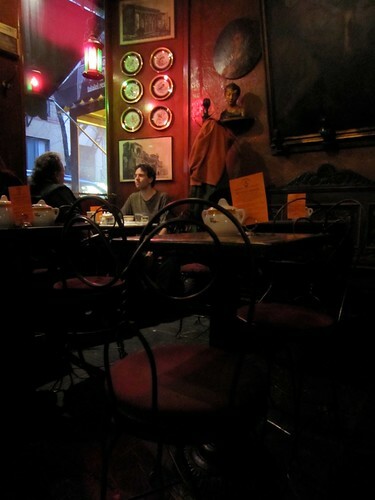 As I sit here in Retro Roadmap headquarters hovering over my cup of tea for warmth, I’m remembering the hot beverages and cozy atmosphere of Caffe Reggio in New York City. 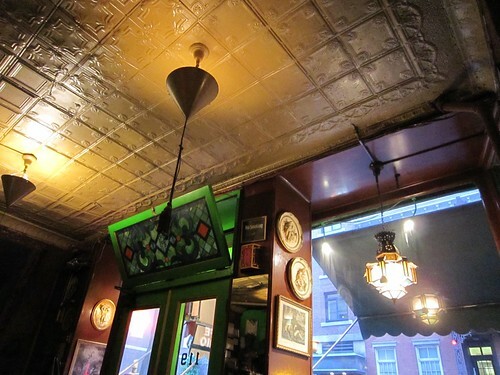 We visited Greenwich Village’s oldest coffee house a few weeks ago thanks to the recommendation of our NYC go-to-guy for all that’s cool in the city, RetromanNYC , and I’m glad we did! 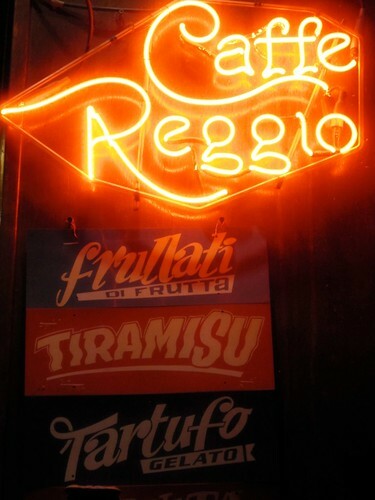 Caffe Reggio is famous for introducing cappuccino to the United States, and proudly displays their original cappuccino machine in their dimly lit yet wonderfully inviting interior. Retro Roadhusband was more than happy to partake in one of their famous cappuccinos (gave it the thumbs up) and I ordered a hot tea for me. I was delighted when my tea arrived, not in a bag, but in a pot, with strainer and all, to catch the loose tea leaves. 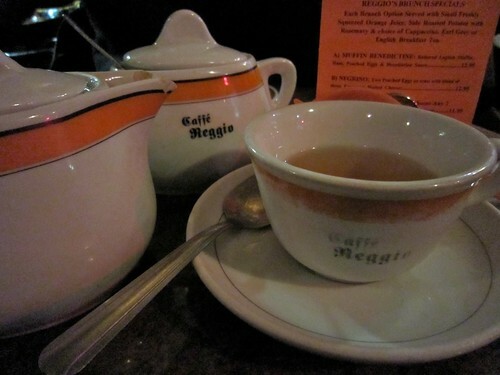 When RetromanNYC suggested Caffe Reggio to us he let us know that it was his mother’s favorite hang between classes (or sometimes instead of classes!) when she attended NYU. 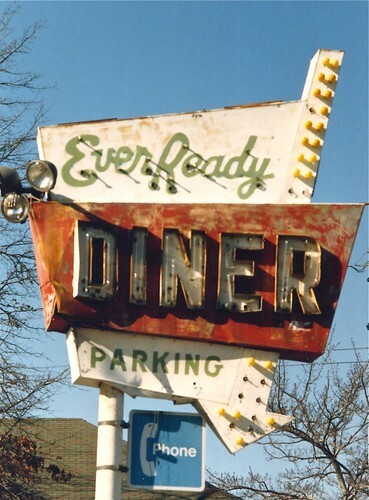 I can see the allure of the place for folks from any era, with the eclectic artwork, surprisingly friendly service and a history of notable customers, beatniks and all. While the cafe is currently non-smoking, I can just imagine a college age gal drinking cappuccino, smoking Gitanes and feeling very continental. Waiting at our marble bistro table for our beverages to arrive it was fun to absorb all of the details of the small space, and watch the steady stream of customers coming in from the cold. I was enchanted by the antique lighting and stained glass, tin roof and antiques, all giving off the vibe that they had been there forever. You can’t buy patina like this. 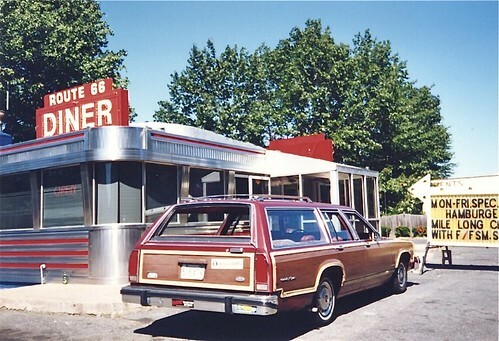 If you don’t mind being seen, there are seats at the window, and for warmer weather there is cafe seating outside. Caffe Reggio also serves soups, sandwiches, pastries, desserts and more- had we not had plans for dinner that evening we would’ve grabbed a bite for sure. 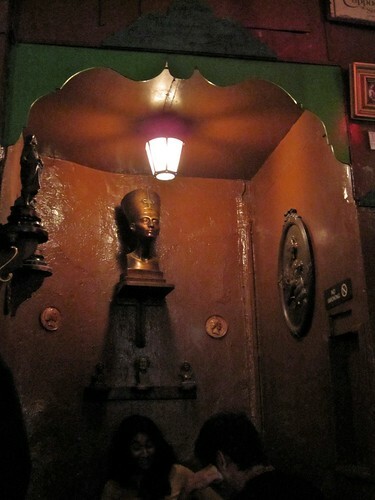 Just writing about it makes me want to go back there right now, and join in the cafe society! As a holiday treat to my mother, sisters and the Retro Roadkids, I ventured to Massachusetts a couple of weeks ago to bring them to a holiday recital on the Great Boston Music Hall Organ, at the Methuen Memorial Music Hall in Methuen, MA. 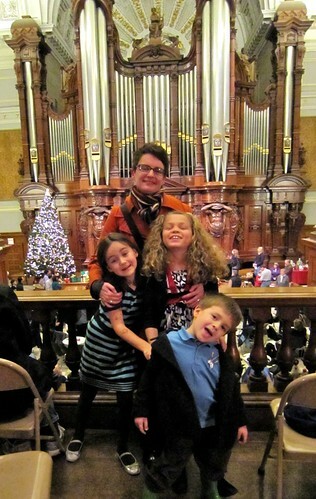 Listening to classic Christmas tunes played on this grand pipe organ, a splendid time was had by all! 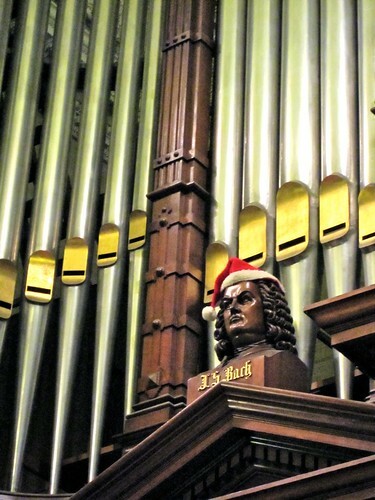 Even Bach got into the holiday spirit! 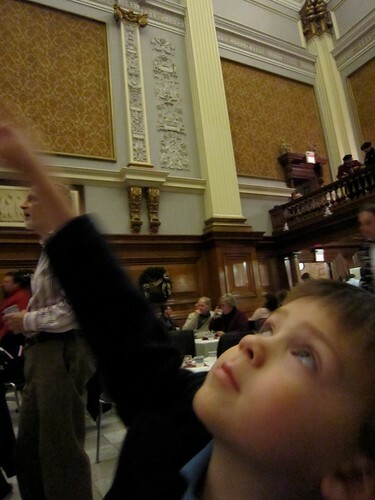 Originally built for the Boston Music Hall which opened in 1852 (now known clunkily as the “Citi Performing Arts Center Wang Theatre”) the organ was inagurated into that space 11 years later, to great public acclaim. However, much like we see today, times and tastes changed. In 1881 the Boston Symphony Orchestra was founded and drew the audience away from the great organ. With the orchestra’s popularity also came need for additional stage space, and it was deemed that this outmoded relic was too big for the hall’s current needs. Despite vigorous protests the organ was sold and removed from the hall. 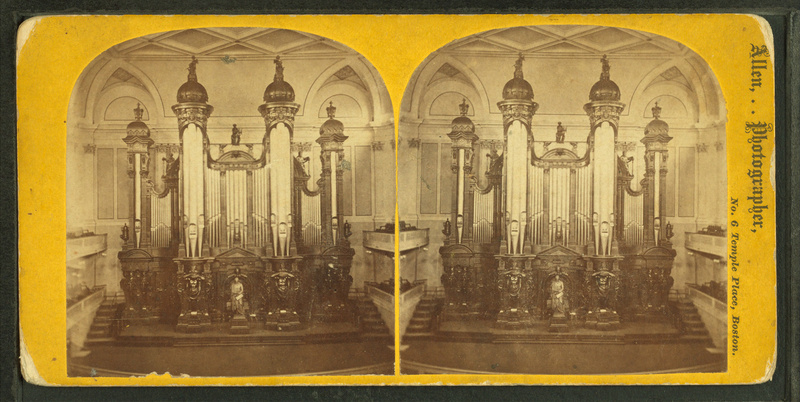 Eventually the organ – which had cost over $60,000 to build, was resold for $1500 to Edward Francis Searles of Methuen. Finished in 1909, the Serlo Organ Hall in Methuen, MA where the organ now resides was built specifically for this great organ and is known for its wonderful acoustics and italianate decor. It is interesting to note that the organ was used only for the private entertainment of Mr. Searles, and the public was not admitted to the hall during his lifetime (he died in 1920). Now on the register of historic places, you’d never know what a fabulous treat awaits you behind it’s classic brick facade. I would not have known about it myself except that I had attended a wedding there years ago. It’s a beautiful space for a wedding for sure. We were lucky enough to attend this concert before they closed up for the winter (can you imagine how expensive it would be to heat such a place?!) but please keep this fantastic destination in mind and check out their website to learn when they re-open in the spring. It’s truly a hidden gem! 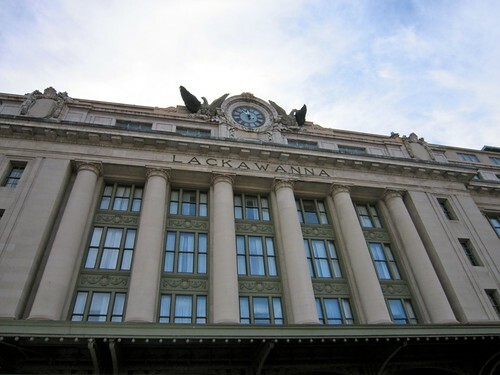 Many of the people who came to the RetroRoadmap / Roadsidefans meet-up in Scranton told me that the tour we took of the historic Lackawanna Train Station – now a Radisson Hotel in Scranton, PA was a highlight of their visit. As this tour was my idea I was pleased that this was such a success, and recommend you stop by the Radisson if you’re ever in Scranton. It’s Beautiful! The building itself was constructed in 1908 and while it did go through the decline that many historic rail stations have, I am happy to report when a classic gem like this avoids the wrecking ball (see my post on Worcester’s Union Station as an example). I cannot rave more about the prompt and professional service that I received from the staff at the Radisson in Scranton, from my first email exchange with General Manager Michael Kearney to the friendly, informed tour given by Front Office Manager Rae Lynn Barrett. I have recently planned a lot of events via email and have to say that these two definitely left a positive impression on me. The hotel was in fine form as we arrived, serving an elegant brunch in the main hall with live accompaniment on a grand piano. 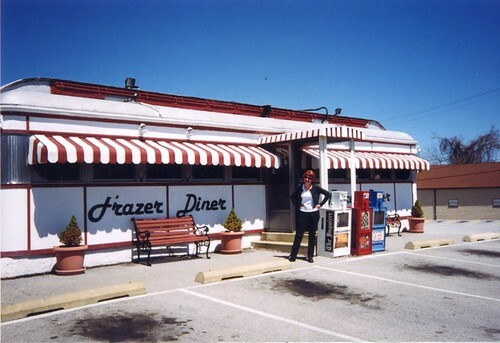 While we were all technically looking forward to eating in the Glider Diner, each of us commented at one point that had we known the brunch would look and smell so delicious, we would rather eat here. RetroRoadhusband and I have put it on our map for a nice Sunday drive for sure. 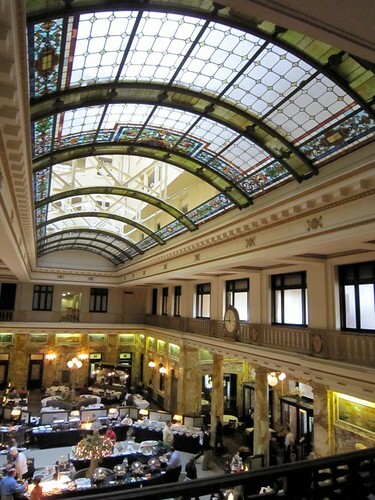 The stained glass roof above the main hall is reported to be Tiffany glass – and (horror of horrors) the reason that the middle sections are missing is that during a period of decline and closure of the property years ago, construction workers threw the furniture from the floors above THROUGH the wonderfully decorative glass ceiling!!! At least there are some sections left to admire. When we met up with Rae Lynn I did not know what to expect from the “tour” and thought perhaps she’d just point to a few areas of interest and let us roam around. Our entire group was delighted when we realized we were getting a behind the scenes guided tour of the property, including trips to the old safe, wine bar and even the…MORGUE! 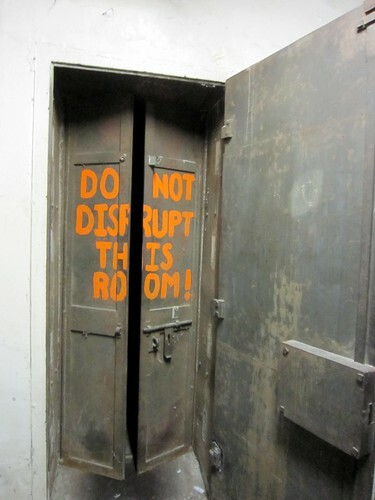 Yes, that’s right, the morgue. 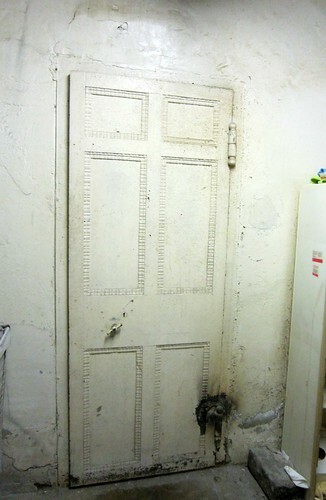 And behind that door…another door! Rae Lynn knew many facts about the property and her pride in working in such a wonderfully historic property was in evidence. We too were caught up in her enthusiasm for the details she pointed out, such as the green tiled walls that now line the Trax bar, to the decorative marble surrounding the main hall and cozy wine bar. 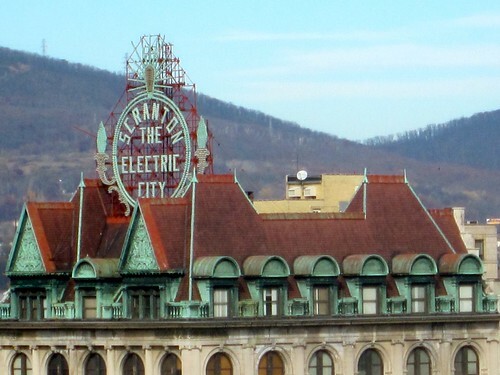 Even if you don’t arrange a private tour like we did, do yourself a favor and poke your head into the Radisson at the Lackawanna Station if ever you’re in Scranton. It’s a marvelous testament to the grandeur of the past, and a thumbs up to a company like the Radisson who are keeping this gem viable for hopefully the next 100 years! Using a digital camera and making multiple exposures for each light source and then combining them together in software, Woolf has tried to recreate the lurid color and dramatic lighting of these roadside structures. Digital photography enables this process, which would not be possible with a traditional film camera. 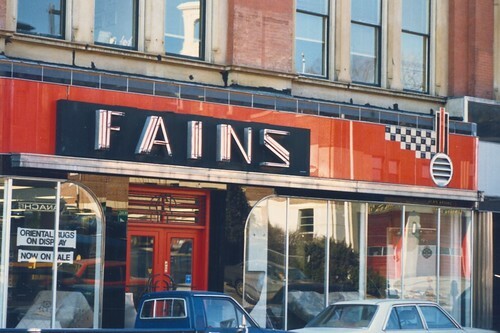 The popular architectural treasures highlighted in the photos date from an era when commercial buildings were more playful and symbolic than they are today. In the mid-1900s, builders constructed even common structures with a high level of craftsmanship and imagination. 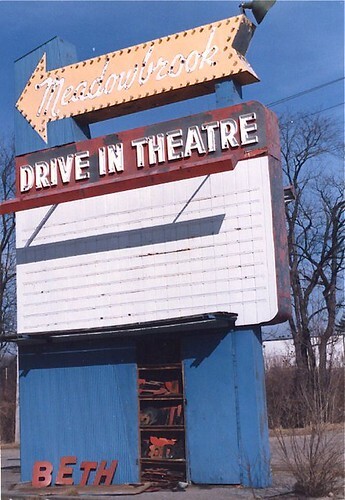 Some of these relics remain, and Woolf has captured them before they fade away.